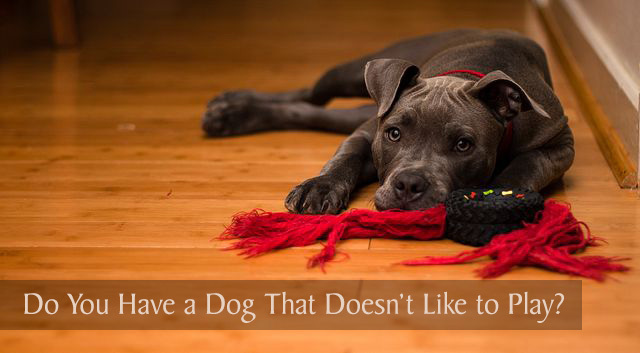 Do You Have a Dog That Doesn’t Like to Play? I recently read an interesting article by Jen from Puppy Leaks called A Game of Tug is the Best Training Reward I’ve Found where Jen talks about how she uses a tug toy as a training tool for her dog, Laika. Training often involves using treats for motivation but Laika loves tug-of-war so much that Jen discovered using a tug toy to play with Laika can be a powerful motivator and reward, even against Laika’s desire to chase cats. Jen’s article got me thinking about how important play is to most dogs and I can’t help but wonder what’s going on with dog owners that say they have a dog that doesn’t like to play. I’ve always had very playful dogs. Haley is ready to play at a moment’s notice, even if I wake her from a sound sleep. But I’ve heard this statement from a few dog owners before and I’ve seen similar comments left on websites about dogs that are disinterested in playing. It’s understandable that older dogs or dogs that are ill may lose interest in playing, but the idea of a dog that doesn’t like toys or playing is foreign to me. Puppies are born to eat, drink, sleep, poop and play! Play is an important part of their young lives and it’s through play that they learn manners and how to get along with one another. So we know at least during this phase of a dog’s life that they like to play. When someone tells me their adult dog doesn’t like to play, I often wonder about the old nurture vs. nature debate. Is it in their dog’s nature to not enjoy playing or did the dog owner not play very much (or at all) with their dog? I know it’s somewhat common for rescue dogs to not know how to play which makes me think it’s more about nurture than nature. There are various ways to play with a dog and certainly different dog breeds prefer different play styles. Retrievers typically like to fetch, scent hounds love playing Find It or Hide and Seek games using their noses, terriers were mostly bred for chasing and rooting out vermin and like shake and kill games and squeaky toys. Herding dogs may prefer chasing games, agility or Frisbee catching. The breed or mix of breeds of your dog will give you a clue as to what type of play style they might enjoy the most. The way we interact and play with our dogs also has a bearing on how much our dogs enjoy playing with us. Dogs seem to respond more to people with high-pitched, enthusiastic voices and a playful attitude rather than someone who is very laid-back, soft-spoken or uses a monotone voice. Dogs seem to sense when we’re having fun playing which in turn increases their exuberance. They are masters of reading our body language and they look for our play signals. While researching how dogs play, I came across this interesting article on play signals by Scientific American called It’s Not You It’s Me. What about dogs that don’t like toys? Is it that they don’t like toys or they don’t know how to play with them? 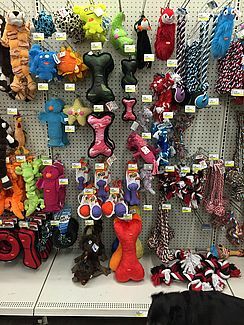 There’s such a huge variety of dog toys: Balls of all shapes and sizes, squeaky toys, hard and soft rubber toys, stuffed toys, tug toys, treat-dispensing toys, throwing toys, etc. There are dog toys in practically every shape, size and texture to appeal to all of your dog’s senses. Haley likes almost any kind of toy, except tennis balls because of the fuzzy texture on the outside of the ball. Every dog has their toy preferences, so it’s a good idea to experiment with a variety of toys to find out what appeals to your dog. I think in most cases, a dog that doesn’t like to play is a dog that can learn how to play. Here are some of the favorite ways dogs like to play and some tips if you want to help your dog discover how much fun it is to play with you. If your dog is timid or fearful, work at a slow pace so he’s not overwhelmed. Always keep the play sessions light and positive. Food-stuffed toys are a great way to make a positive association with a chew toy. Put something tasty, such as a little peanut butter, on other toys to attract your dog’s interest. 3. Have a positive play attitude. Be enthusiastic and excited to play with your dog but try not to be overwhelming. Use the right tone of voice to encourage interest in playing. Heck, why not even try to initiate play with your own play bow. 4. Show interest in a toy. If you play with and act very interested in a toy, your dog may come to investigate. He may think he’s missing out on something good and decide to play with the toy. 5. Rotate your dog’s toys. Buy a variety of toys but only give your dog a few at a time. Rotate them occasionally to ensure they stay interesting. 6. Experiment with different play styles. Every dog has their preferred methods of having fun but try different ways of playing to see if you can engage your dog. Dogs get bored, so look for inventive ways of playing. Movement will usually trigger a dog’s chase drive and they love scrambling after something like a rope toy being dragged across the floor or a toy tied to the end of a flirt pole. 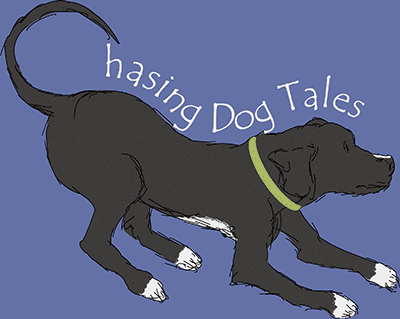 Animate your dog’s toys by lightly teasing your dog to peak their interest. Don’t play in a way that frustrates your dog or he’ll likely lose interest in playing with you. Light teasing with a toy to get his attention is good, but don’t play extended keep away or grab toys out of his mouth. 9. End the play session if your dog gets over-excited. Games like tug-of-war or wrestling can cause some dogs to get pretty riled up. Growling is normal, but if you sense your dog is getting too worked up or he’s playing too aggressively, have him drop the toy and take a break from the action. Don’t continue playing until your dog is exhausted or loses interest. Stop the action a little early while he’s still interested to make him excited about playing with you again next time. 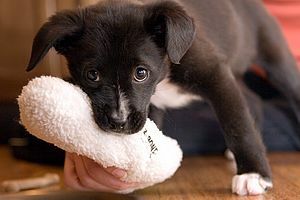 Puppies learn from playing with their mother and littermates and as adults they continue to learn by playing with you. It may seem like you’re just providing some casual entertainment for your pup while playing, but he’s learning manners, self-control and problem-solving skills. He’s also getting some mental stimulation and exercise while you build a strong bond together. I’m curious what you think about a dog that doesn’t like to play. Is it nurture or nature? Also share your tips if you ever had to teach an adult dog how to play. Update: If your dog brings a toy to you but doesn’t seem to want to play, maybe your dog wants to make a trade. Check out my post, Do Dogs Barter? – Trading Toys for Treats. Who Owns the Dog Toys? Our previous dog, Pip, was not much into playing. He preferred to sleep and take a more relaxed approach to life. Our new dog, Ruby, is just the opposite she is ready to play at any time – loves fetch, tug, etc. Some dogs, depending on age, are bred to be “lap dogs” and may not be as interested in playing. Other breeds, however, have been bred to “do a job”. If you want a happy home life with your dog, the human needs to follow your tips about “breed” and find the type of play that will satisfy the dogs “drive”. If you don’t you could end up with a “Marley”. P.S. 9 years old and I still enjoying playing. You look amazing at nine, Hawk! You’re right, a dog that can play or have a job that’s aligned with his breed is one happy dog. OH and he plays with our other dog who’s about 2 months older! I absolutely believe that there are some dogs who are not motivated to play a higher percentage of the time than not. Sure you could *train* them to play, but teaching them to *enjoy* play is completely up to them (whether it’s something they want to do more than something else they could do). And this (motivation to do “x” ) is about nature, you can’t nurture around it necessarily. I’m certain that if you looked at these dogs as part of a litter, you’d see different amounts of play tendency within the litter (just as you would prey drive, confidence, etc). I’ve always been told by English Shepherd breeders that there will be one or two “house dogs” (watch, do chores – low motivation) and the rest will be “farm/herding dogs” (play, herd, do chores – high motivation). Mort on the other hand had 20% play tendency that I could nurture up to 110%! He will play with a keychain or a leaf the size of a quarter as much as he will with a tennis ball. Tig is a serious dog. That’s just who she is. She is incredibly smart (she will train herself by just watching me train Mort to do something). She will play once every couple weeks, but very rarely with a toy (she prefers playing with us or with Mort). She will do what she feels needs to be done, like fetch Mort and bring him to me if he’s doing something she thinks he shouldn’t (no training, all nature). I have tried every single type of toy (texture, type, size), probably two dozen different methods of instilling motivation, have a huge arsenal of ideas from world class behaviorists. She has next to no motivation there, looks at me like I’m crazy or something, and when she does play (tug a little etc) it lasts for maybe 30 seconds before she does something else she prefers to do. Motivation. Nature. I don’t believe for a second all dogs are created equal, and all dogs can do “x” well (be it play, trained, etc) despite all having some genes for these things, but the question is drive. It’s all about enhancing what they’re motivated to do and enjoy, whatever that might be. For Tig, her gig is going for hikes and if she had a choice her game would be chasing squirrels and watching me train or play with Mort while she enjoys the sunshine and *not* doing those things! Thanks for your thoughtful comment, Jen. It’s interesting that you could develop the play tendency in Mort and yet Tig sounds like she’s definitely motivated by her nature. I’m fascinated that Tig trains herself just by watching you work with Mort. I know dogs learn a lot from observing each other, but she sounds amazingly smart! Hi, this is very interesting! Both mine love to play, but when it comes to rewards, such as for agility, my oldest, Earl, much prefers food. Ethel, being young, is into everything, and much in the middle! You know how it goes! That’s interesting! Is it easier to train Earl for agility since he’s food motivated? Is the fun of doing agility itself what keeps Ethel motivated? It’s interesting how different drives and motivations come into play. Great post! Mika has never been big on playing, but if I have the perfect toy, she is all for it! What the perfect toy for Mika? I’m guessing some type of stuffed toy. Mr. N plays with toys but he has very set times when he feels like it. He likes to play after dinner and sometimes after a walk and if we have guests over, he’ll drag out all the contents of his toy box and parade around with them. And he definitely does that terrier shake and kill with his stuffed toys. Charlie is the true retriever, loves to fetch! Harley came to live with us at age 2 and really didnt have experience with toys that we could tell. He likes to mouth stuffies and will occasionally play tug but by no means is he a playful boy with toys. These are great tips! Charlie and Harley sound very different from one another. I wonder if it’s true that Harley didn’t have a lot of toys or opportunities to play before he came to live with you. I’m glad he likes stuffed toys now, those are Haley’s favorites too. Both of my boys like to play but on different levels. Sherman is obsessive about playing with one specific type of toy and doesn’t give others a second look. Leroy will play with just about anything but he seems to have a very short attention span. Thanks for commenting, Jen. I love getting all the feedback from people with multiple dogs. The contrast between play styles and interest in playing is fascinating. I think it’s a bit of both nature and nurture that determines how playful a dog will be. Rita was living in the “mean streets” in Mexico when she should have been learning to play, so who knows. Maybe she’d be a bit more playful if she’d had a more normal puppyhood, but who knows. Having said that, she does like to play, but she’s just not a play play play all day kinda girl. She’s not big on fetch, but she loves tug, chase, wrestling and shake & kill! I didn’t know about Rita’s history in Mexico. She’s a very lucky girl to have found a wonderful home with you, Jackie. My little dog Phoebe is a rescue. She was terrified of men and didn’t seem to know what to do w/ a toy. After a few months we discovered, during Christmas, that she will chase paper if you throw it. It was the first time she showed interest in any sort of play. Now she’s a toy loving pup and can’t wait to play w/ us and our other dog! I’m not sure if she was just too shy & frightened at first or if she didn’t know how to play, but I’m so happy she loves to play now. It’s delightful watching her! Very interesting – neither Jack or Maggie play much at all. Maggie is like Tig (from Jen’s comments) all business. She won’t hold anything in her mouth, so fetch, tug, etc. are all out. I’ll try a few of your tips, but I think her background really impacts her behavior. Great tips, I’m lucky and my gang loves to play in some form or another. I have seen people at competitions weather it is at a dog show or agility trial get a tug toy out and give it to the dogs to get them hyped up or as a reward for doing a good job. That’s one thing I haven’t really tried because Haley’s always been very food motivated. Since she’s also super playful, I’m going to try Jen’s advice and see what I can accomplish with a tug toy and playing as a reward sometimes. This is something I’ve wondered myself. And I’m still not sure. I wonder if play might look so strange for some dogs that we humans don’t recognize it. Like the vigilant guard dog who keeps an eye on every chick in the barnyard. We started Honey on food toys when she was 2 months old. At first, it was just kibble in a soda bottle we turned upside down for her to knock over. I think it has made her associate play with yummy things. Thanks for these helpful tips. I will have to try these tips with the dogs at my parents’ house. Jade is eager to play but is stubborn and will not return the toy after a certain amount of time. I can’t wait to implement these ideas. I hadn’t thought about types of play for hunting dogs and if they would still enjoy forms of play that are also much like the work or training that they do. FINALLY I have found someone who ownes a dog with identical behaviors as mine! 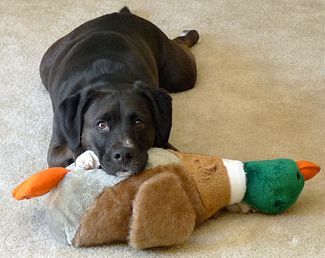 I too had one dog, Subaka, who loved to play in anyway she possibly could and my other dog, Dax, could care less…..except for the 30 seconds every couple of weeks, and never with a toy. Just with me. He loves to hike and ride in the car. Other than that, he is content to lay around all day and sleep or observe. He is a very sweet, low-key, low maintenance fellow! And also very smart! Thank you so much for your comments! I can finally stop worrying about “what happened to him before he came to live with me?”! I’ve always thought that maybe Dax could have been miss treated or even had a birth defect. Thanks again for sharing about your dogs! Aw, I’m glad you found some answers, Jill! It sounds like some dogs have maybe never learned how to play and others just aren’t that interested in playing and that’s perfectly fine too. I think a lot of people who adopt adult dogs or rescue dogs wonder about certain behaviors when they don’t know what might have happened in the past, but I’m glad this puts your mind at ease about Dax. He sounds like an amazing dog and Haley would agree, nothing is better than a car ride or hike in the woods, lol! ? I got a rescue dog about 3 months ago. She is super well behaved, and when we go on walks (twice a day!) she is super active on the leash. However when we are at home, she is a total couch potato. I have tried having her around other dogs, and she is fine, but not interested in playing with them. I have a few toys and she has NO interest. She is an 18 month old mini-Schnauzer mix who had a pretty tough first year. (heartworm, puppies too young, dental disease). She is lovely with people, but I just wish she had more “fun”. Should I be concerned? Hi Kasandra! You are so kind-hearted for rescuing your sweet girl and giving her a loving home, especially since she’s had a rough start in life. I wouldn’t worry at all about her not wanting to play, but maybe look for what types of things peak her interest or get her attention when she’s at home and see if you can build on that. You could also start incorporating some types of play while you’re out walking, since that’s when she’s active and interested in things or try playing with toys while she’s on a leash in the yard or even inside the house. I grew up with miniature schnauzers and our dogs liked to dig in blankets and hunt for toys when we would bait them which is a good way to connect with their terrier instincts to be ratters. Because of her background, it might take a little more patience and coaxing to see if she likes to play, but as you can tell from the other comments here, some dogs just aren’t into toys or playing that much and that’s perfectly fine too. One other thought, as you work on training and creating a stronger bond with her, you might notice that she’s more trusting and open to playing with you. Just experiment with different types of toys and play styles and have lots of patience but definitely don’t worry about her if she just wants to chill around the house. I’d love to hear back from you later to find out how things are going. You’re wonderful for rescuing her! ? Thank you for the ideas! I do have a Kong – will try the hide and seek. We rescued a beautiful 18 month old/27 lb girl a couple of weeks ago (looks like a GS/Corgi mix). Her previous owner just moved and left her (she is very smart, sweet and learns things so quickly). We run with her almost every morning and she loves it! She loves being outdoors and exploring the city and the country (we split our time between city and upstate NY) and going on little adventures in parks and hikes with us. I will keep trying, but this article and comments were very helpful to me as I thought I was the only one who had a dog who didn’t love to play all the time. Thank you so much! Hi, Elizabeth! Your pup sounds very similar to KJo’s dog. It very well could be that she adapts to what you’re doing when you’re at home relaxing. I know Haley’s that way most of the time and on days when we’re really active, she likes to take it easy for the rest of the day. It also could be that her previous owners never played with her, which wouldn’t be too far of an assumption since they moved and just left her behind. I can’t believe somebody would do that. I’m so glad you found the article and comments helpful. Your sweet GS/Corgi girl sounds pretty well adjusted to me and I’m sure she’s happy to have her new loving, family. ? Rescued a 2 year old mini schnauzer she is a very well behaved ,dog loves to go for walks but does not have any interest in playing have tried different toys etc but maybe because she was a breeding dog doesn’t really know how to play.Most days she just hangs out or wants to cuddle my next step is I may take her to a dog socialization class and if that does not work I guess just let her be and when not so cold out we will go out to the park. Thanks for your comment, Connie. I would love to hear back to see if the socialization class works. My niece also rescued a miniature schnauzer that was a puppy mill dog and she didn’t have any interest in playing either. It’s wonderful that your girl likes to get out and go for walks, my niece’s dog was pretty shut down and traumatized by her early life experience. We got our dog, Genteel, yesterday. He’s a fine dog and very timid and nice, but he won’t play. I’m not sure why, but I’m thinking that he never knew how. He’s eight months old, and I don’t think he previous family ever played with him. Any idea on how to play with him? Hi Grace, Congratulations on your new family member! Genteel might need some time to adjust to his new home but after a few days, try some of the tips in the post to see what might peak his interest. If he never learned how to play, you’ll be looking for subtle signs of interest that you can possibly build on. What breed or mix of breeds is Genteel? Sometimes you can tap into what a dog’s breed was bred to do in order to trigger some interest. I have a new puppy german shephard and we were playing ok for the first week and then she slowed down gradually. I am the only one here most of the time and at first I thought her sleeping habits were normal but now she just stopped playing and sleeping all the time. I bought toys for her and she is just not too interested in them. I tried to take her for small walks she don’t want to do that. I tried to find other dogs that dhe could play with and that kinda failed when the other dog refused.I have set up another play date this weekend hopefully it works out. I know I made mistakes in the last few weeks and I have no other pets or kids for her to play with but I wan rtf her happy can you give me advice? Hi, Sandy! Puppies do sleep a lot but they also like to play a lot and are pretty active. She may just be very shy but if she’s still sleeping all the time, it might be a good idea to have her checked by your vet to make sure there’s not a reason for her to be so inactive. Have fun with your sweet girl and take your time while discovering her interests. If you get a chance, I’d love to hear back later about how things are going. ? My Karli is a 10 yr old Chihuahua. When she was younger, she played with toys and carried one around but as she’s gotten older she seems to have no interest. She’s still an energetic, young spirited dog but when you toss a toy to her she will play with it for less than a minute and then she’s over it lol. Hi, Jacqui! I’m so glad you mentioned your experience with Karli, because I didn’t think to mention how common it is for dogs to lose some interest in toys and playing when they get a little older. I guess they’re similar to people in that respect, our interests change over time and we find ourselves enjoying new things. Karli sure sounds like a sweetheart at 10 years young! ? She sounds like a very lucky girl to have found a loving home with you! You make such a good point too, that all dogs are different and we need to find the things that appeal to them and what they enjoy doing. She sounds very content to just hang out with you and watch over things. I haven’t met a Tibetan Terrier in person before, but they are gorgeous dogs. I’ve heard of farms where you can take a herding dog to learn or practice sheep herding. I wonder if there might be something like that close to where you live. My husband and I adopted a 2 yr. old Boston Terrier/Whippet mix this past Thursday; she’s been staying with us since Tuesday since the rescue we got her from wanted her to have a couple of days to get used to us and make sure she would be a good fit with the family. She was initially rescued 8 mos. ago as a stray, and we were told she was adopted once and brought back for “behavior issues” (the rescue found out she’d been mistreated and had begun acting out in retaliation). While she is a sweetheart and loves to cuddle and give kisses, we haven’t found exactly what she might like to play with just yet. Before she came, I bought a squeaky cuddle toy and a tug toy to at least have a couple of things she could play with – she’s touched neither – and her foster brought along another squeaker and some hooves. She LOVES the hooves, but hasn’t touched any of the other toys. I read a few other articles along with this one and you all seem to agree on having a variety of toys to stimulate the dog’s senses and mind. This is the first dog for us together, though we’ve each had dogs as kids, so we’re kind of relearning the process. I grew up with a German Shepherd who made pretty much everything a toy, so having a dog now that doesn’t play [yet] is a little strange. We’ll just have to experiment and see what piques her interest. Hi Shiny! Your new pup sounds like a sweetheart and I’m sure she still needs some time to relax and adjust to her new home. Maybe you’ll discover soon if she has some prey drive and likes to chase things or what seems to motivate her. In the meantime, try using those hooves or other treats to discover clues to what she likes. Trying hiding them to see if she might enjoy nosework or bury them in a toy box to see if she’s a digger. You could also put one inside a cardboard box to make a puzzle out of getting the hoof out. I think she’ll start showing you little clues about what she likes and then you can try to build on those clues and turn them into a game or play session. Congrats on your new member of the family and you’re wonderful for giving her a loving home! ? I enjoyed reading this post. I am trying to learn more about my dog’s utter disinterest in play. Jackson is a six year old rescue lab/pit/german shorthair retriever whose only interest seems to be stalking squirrels or chipmunks in the backyard. I’ve tried every strategy I can think of to interest him in play but no luck. Jackson is a very dignified dog. He is quiet, gets along with everyone and occasionally will wag his tale when it’s time for a walk, and that’s about it. We love him! Hi Steve, Jason sounds like a wonderful dog and with his mix of breeds, I can imagine he’s quite handsome too! I wonder if he would like a flirt pole type toy like this https://www.chewy.com/outward-hound-tail-teaser-refill-pet/dp/113717 since he likes to stalk squirrels and chipmunks. It’s really easy to make your own at home too with an old stuffed toy and maybe a treat tucked inside somewhere. Then again, as a dignified guy, he may look at you with that expression that says “Really?” That’s okay too, some dogs are content with just doing their own thing and that’s just fine. Thanks so much for your comment and for stopping by the blog! ? We recently adopted a beautiful Husky girl they thought was around a year old. I have bought every type of toy I can think of, and she is just not interested in any of them. I even put peanut butter on one, and she didn’t even lick it off. She seems irritated by the sound squeaky toys. I haven’t tried a Kong yet. I think that will be good as it is also a challenge. This is my first Husky, and I have heard they are wicked smart and can get bored. I also think taking her to places she can play with other dogs will be key for her, but most of them around here require you have the dog for 3 weeks before bringing them in. Aw, I bet your Husky girl is just gorgeous! I’ve heard some people say that Huskies would rather run and romp around with other dogs than play in the traditional sense, so I bet she’ll love the dog park or group play area when you visit. I would love to try skijoring if I had a Husky or maybe rollerblading or biking while they run along side. I have heard of some Huskies enjoying fetch, but I imagine their breed loves running most of all. Congrats on adopting your new girl and I know you’ll find many fun activities to enjoy together.? Thanks for the reply. I have actually been asking around, and I guess it is pretty common for rescue dogs not to play. I have heard it from a bunch of people know, with anywhere from 3 weeks to 6 months before they settle in. Looking forward to the journey! I have two dogs. I’ve had Chloë since she was 9 weeks old and Riley sine he was 10 months old; they are 7 months apart in age. 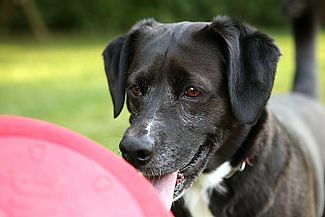 Chloë loves to play…she’ll chase her ball for hours, will play tug of war, she’s always up for a fun time. Riley isn’t much interested in too many games, although he loves hide & seek and kibble toss; if food is involved he’s in! Other than that he isn’t interested in other forms of play. He will occasionally join in when tossing a toy but that’s a rare occasion. Chloë is from a “back-yard” breeder and is a mixed pup and Riley is from a reputable breeder and is a pure bred. His breeder has had many dogs disinterested in play and Riley’s grandmother is one of them, where as his dad loves to play and is the only male dog that loves when the new puppies are born so he can play with them. I think that it can be either nature or nurture it just depends on the dog. Hi Tara! It’s interesting that Riley’s breeder mentioned many of their dogs aren’t that into playing. What breed of dog is Riley? I know some breeds just aren’t that interested in play or they like a certain kind of play. I think you’re exactly right about it being a mixture of nurture and nature. It sounds like Chloe and Riley get along very well together and respect each other’s personalities. I bet they’re both wonderful dogs. Thanks so much for stopping by and sharing!? Help, my husband and I rescued a 4 yr old male bichon from a puppy mill. He was used as stud only, now neutered. He never was touched with love, no freedom but a small box kennel. He has finally come out of going around and around in circles in the house. He is housebroken, however afraid of the door, has to be carried to the door after several minutes of trying to catch him. Very shy, has just been introduced to grass. But how do I introduce him to play, and toys? I know this is going to take some time but breaks my heart this beautiful boy can’t enjoy play and has a long life with us. I want him to have a fun and happy life. You are so wonderful for adopting your new best friend and saving him from such a horrible existence. It sounds like he’s doing really well so far, considering his early life. You’re right, it will take some time until he’s comfortable with his new environment. I would focus on creating a bond of trust right now and helping him overcome his shyness and fear of the door (and any other issues he might have). This will help him relax and build some confidence, then you can try some of the tips in the post again to see if he’s interested in playing. After being in a crate for the first four years of his life and not being exposed to playing with toys or other dogs, it’s possible that he might not be interested in playing. The good news is, that wouldn’t necessarily mean he’s not happy or content with you. Once he’s had some time to really get comfortable in your home, watch for anything that seems to peak his interest and build on that. It might take some observation and a little creative thinking on your part, but if you discover what makes him happy, you might be able to expand it into a type of play. If he’s not bothered by being around other dogs, a play session with another pup might be helpful in bringing out his more playful side. There’s a lot of satisfaction in helping a dog overcome fear (or any) issue, so celebrate the achievements and progress you both make along the way. Give your boy a hug from me and Haley and good luck with the training, socializing and the playing!? I had two dogs, a 2 year old and a 9 year old. The 2 year old loved to play tug-o-war with the 9 year old. After the 9 year old passed away, few years later, the younger dog lost all interest in playing with toys. We even tried tug-o-war with her but she loses interest quickly. She loves to rough house with us, just has no interest in toys. I wonder if she associates the toys and/or tug-o-war with the loss of her friend. So we have two dogs, they truly love playing fetch. As though it may have seemed. We’ve had Charlie for over a year longer then our Daisy. Both were puppies when we got them. Charlie now over two years and Daisy a little over year 1/2 old. We would throw a ball & they would get all excited run and chase the ball bring it back, no problem. Then all of a sudden out of the blue you would throw the ball, Charlie wouldn’t chase or vice versa and they would mimic one another and act all timid. You would tell them “go get the ball” in a cherry, lovable type of voice and they still look at you as if they are in trouble and they both lay down. They have been doing this for almost 5 months now. One will always copy the other and completely stop what they are doing. I don’t get it?? Its so annoying …our Charlie had no problem playing and fetching. We got Daisy when Charlie was about a year old he absolutely loves her. But now they act like they are intimidated by playing fetch. Hey Wendy! Did they used to both chase the ball at the same time and hesitate over which one would grab and retrieve it? If so, maybe they both have some competitive anxiety when going after the ball at the same time. Have you tried throwing two balls at the same time, maybe slightly apart from each other. It would be interesting to try different types of toys or sticks to see if that would make a difference too. Maybe try shaking things up to see if Charlie or Daisy can help give you a clue about what they might be thinking. I’m reading all of these questions and answers and trying to pick up any little gem that might help us with our situation. I really appreciate finding people with very similar situations as well as your responses and suggestions! About four months ago we adopted a rescue who they think is between one and a half to two years old. She is a mix but has been identified as having a good deal of Nova Scotia Duck Tolling Retriever in her. We have no idea what else is in her but we are starting to believe it’s some sort of hound dog because she pretty much does nothing but lay around and sleep. When we do take her out for a walk she becomes a different dog, very happy and active and spends most of her walk with her nose to the ground. If she sees rabbits, squirrels and even birds she very happily wants to chase them. Of course we walk her on a leash so we have no idea what she would do if she actually caught one. I feel like I’m changing topics because in the four months we have had her there are multiple things that we are working on at any one time, she has leash aggression (I will be getting her a harness soon, separation anxiety (we just started trying calming chews as well as a thunder shirt) and anxiety riding in the car which she did not have until we had to recently travel by car from the West Coast to the East Coast) and although she was doing pretty well in her crate, we left her the other night for four hours after giving her a walk and when we returned she had Peed in the crate and was pretty upset. She does seem to be housebroken but has had a few accidents, but we are figuring out ways to help her avoid that. We thought having her crated when we went out would help but apparently we may have a new problem. Did I mention that she will stand very still next to us and wait to be told to go, and often will just wait with her nose to the wall. Sounds like a lot when I put it in writing but we really do feel she’s a very smart (she learned to “give me your Paw” in one morning) and a wonderful dog with great potential. I should also mention that we are an older retired couple so taking her for hikes or runs is pretty much out of the question for us. Back to the issue of not playing with toys, we also have a very difficult time trying to help her entertain herself with things like chew sticks. She will devour edible chew toys but they really don’t offer her much in the way of entertainment. I even offered her a Kong with peanut butter in it but she calmly licked out most of the peanut butter and actually left some in the Kong when she was done with it. No further interest in the Kong. When we first got her I bought a little stuffed bird and worked with her to get her to go pick it up. We would say go get your Birdie and she would and then carry it to her bed. At first she gave it a couple of licks, but after a few weeks she just totally ignored it. Often when it comes to playing with toys I read advice to try a multiple of toy types but frankly that involves spending quite a bit of money on toys that we feel she will likely ignore. She does not chase balls , Will not put anything in her mouth to play tug, She even ignores sticks outside. She will get someone playful with us I wrestling but that is pretty occasional and does not last long, I really only happens when she’s excited after not seeing us for a while. Every day I find myself researching and reading to resolve these issues and I’m beginning to feel overwhelmed and unsure about what to deal with first as perhaps some of these things are certainly connected. Oh my gosh, you really are working on a lot of different things with your girl. She’s very lucky to have been blessed with such a wonderful new home and caring people and it does sound like she’s really smart! It makes sense if you think she might be part hound too, since they love to explore and follow scents. It is expensive to buy a ton of different types of toys, so you could try using some things around the house, like putting some treats in cardboard boxes to see if she likes ripping into them or playing Find It with treats you hide in different places around a room. A lot of scent hounds enjoy following their noses more than playing with traditional toys, so she might enjoy walks and exploring with you more than connecting with her fetching, retriever side. Maybe check to see if anyone offers nose-work training in your area. Maybe try freezing the peanut butter Kongs so they last a little longer (if you don’t do that already) or bury some other yummy treats inside the peanut butter or buy some larger bones that will last quite a while. I got a German Shorthaired Pointer thats reached her golden years, but believe me, hasn’t slowed her down, in contrast with my more mild mannered pitbull. My pitty loves any and all sorts of toys, whereas my pointer has never taken any interest in them. At best, I think I’ve seen her nibble on one a handful of times since we’ve had her. And even then, it’s just laying down and nibbling them. I don’t think the issue is so much that she doesn’t play, and moreso that she doesn’t have the attention span to focus on a toy. Every time we try, she just wants to zoom off and explore. She KNOWS the toy merits no reward, but left to her own devices, she can root out a snake, or bark at a bird or something. Gotta say though. It’s fun to let her loose and watch her go! My 8 yr old dog (female labradoodle/golden doodle cross) does not play at all. Or rather, does not play with humans. She played with her sibling *all* the time (died 8 weeks ago😞) but bcz she always had another dog in the house to play with she was never interested in playing its humans. Humans are for cuddling and belly rubs. Well, now the other dog is gone and I worry that she’s bored. We go to dog parks (she’s not interested in making new friends) and on long walks. Riot of the day is that she’s discovered Home Depot and thinks it’s the most fun place on the planet – many people smile and scratch her ears, smells great. Thinking I’m going to get her a puppy. We have 4 yr old rescue heeler. She doesn’t chase balls or sticks and she doesn’t really take things in her mouth to tug. The squeaky toys we got her are just going to waste. I would like to run and play with her (she will chase), but I injured myself trying to run with her and have had to walk with a cane every since. I so want to see her taking advantage of our big fenced yard but, she sticks to me like glue. Any ideas? I rescue older shelter dogs and sadly, many do not take any interest in playing. As a teacher, I find myself studying the effects of trauma and it seems to me that the dogs could be experiencing something similar. It could be PTSD, or perhaps they missed the critical “play stage” of development by being placed in a shelter? I think it is important for anyone considering adopting a shelter dog, especially if this is important to the adopter or the family, to make sure that the dog they adopt has the personality the family is looking for. Sadly, so many dogs who are adopted are returned to shelters because they “won’t play”. When I adopt a dog who never learned, I accept it and just love the dog all I can. Frequently though, if you adopt from a sanctuary in which the dogs get to interact with each other, they do learn to play with other dogs, even if they do not learn to play with humans. Maybe considering a “dog-sibling” would help with transitioning to playing with humans. I’m a disabled Vet my English Lab, Charlie, died of Cancer when he was only 5. That was a about 3 years ago. A month ago we found a beautiful 4 year old female from a rescue organization. We named her Dixie, she is loving, intelligent, learns fast, but there are some strange things. I believe she has been beaten with a stick … a lot. When I called her while using my cane she would turn around and not come to me. With out the cane she would come but slowly. Not so with my wife Dixie would come right away. I believe a man beat her a lot. When you give her a treat she takes it very slowly shows not excitement or enthusiasm at all. But the reason for this comment is that she doesn’t know how to play at all. She is a retriever but if you throw a ball or a toy duck she just looks at it. She walks with or without a leash. Any thoughts on the possibility of trauma that I believe she experienced her first 4 years of life causing her reacting to treats and her lack of knowing how to play? My son adopted an 8 year old shepherd mix, Rudy. He’s a medium size dog, about 46 pounds. He has no enthusiasm for play or toys. The only enthusiam he shows is for his food (or my cat’s food) or mostly when my son comes home. He goes crazy as most dogs do. Potty training is a challenge that we are working on, but he hates to go outside of the house. He’s not house broken. He doesn’t bark, whine or cry at all. He doesn’t bother us when we are at the dinner table. That’s not a complaint. Rudy’s intake paperwork says he was a stray. His past is unknown. I don’t expect him to do agility training or anything intense, but I would like to see him play a little. I bought him several different toys, which he ignores. One is a squeaky hotdog, which he did take from me and take into the next room, but he didn’t play with it. I did teach him to catch small treats yesterday, which he seemed to enjoy. I really don’t know what to do for the guy. All he does is eat, sleep and poop (and pee).